Detail : The Beatles ninth official E.P. Even less successful then the first E.P. 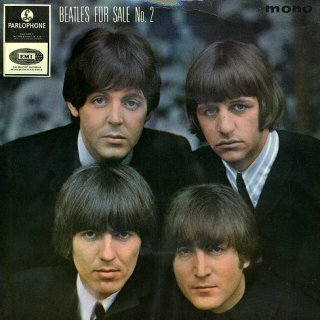 collection from "Beatles For Sale", the main attraction for collectors would be the new colour photograph that formed the front cover which was taken by Robert Freeman. But on the rear, no sleeve notes, and little else to show any real effort by their record company. Around the edge of the label, the words stating the rights of the publishers started with "The Gramophone Co. Ltd." and across the press-out centre the words, "sold in U.K. subject to resale price conditions, see price lists" are present. The embossed "KT" tax code is visible on the side 1 record label. 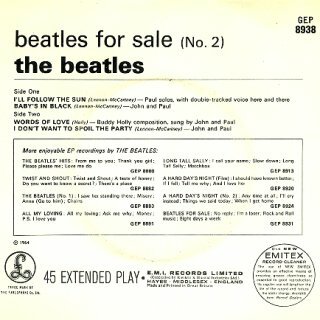 Re-pressings were also made early in the 1970's, which do NOT have "Sold in the U.K. ...". And a further pressing was made in 1973, which added a boxed EMI logo.